Our beloved freelancer and Wiki Wormhole scribe, Mike Vago, has published his fifth book and first novel. 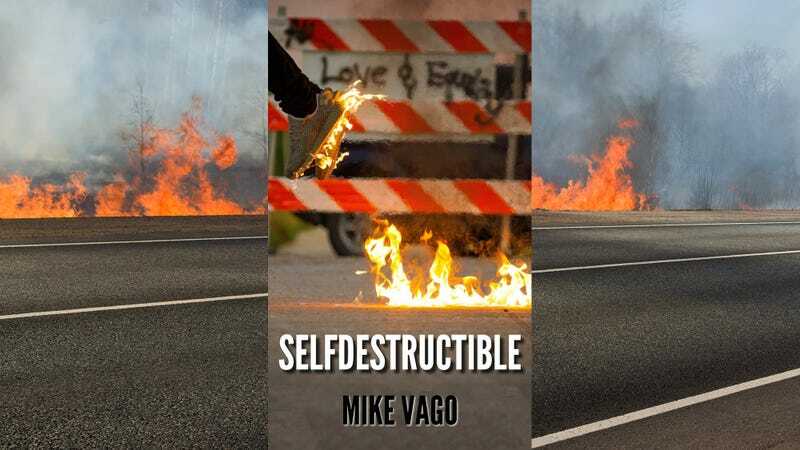 It’s called Selfdestructible, and it’s available on Amazon now. Selfdestructible takes place in a world where superpowers are genetic. Two characters grapple with their powers and their responsibilities: a 24-year-old borderline alcoholic is hitting rock bottom and trying to stay out of trouble, haunted by her superhero parents’ deaths while doing the whole hero thing. Meanwhile, a 15-year-old boy nearly burns down his school when he discovers he can shoot fire from his hands—something he wasn’t expecting, as his parents don’t seem to have powers themselves. Mike Vago mines the genre conventions of young people with superpowers to tell a story about potential, growing up, and growing into yourself. The stakes are life-and-death for these directionless not-quite-superheroes, and Selfdestructible is a fast-paced adventure that mines extraordinary abilities to tell a grounded story about damaged people finding their place in the world. And if you’re looking for novelty kids’ books, check out Vago’s other four books. Wikipedia proposes a toast to… toast!